Dazian has been a household word in the Exhibit Industry for developing unique functional and decorative fabrics and creating one-of-a-kind fabric environments. Dazian adds an element of visual theatre to Trade Shows, Meetings, and Corporate Events. Whether you know us as the originator of high-tech ceiling fabrics for the auto shows, the creator of wide with IFR stretch fabrics for tension structures, exciting lighting and projection surfaces, premium pipe and drape, flat booth panels, and knock out stage sets, Dazian is the only soft goods company that can provide you with the complete package for both sales and rental. 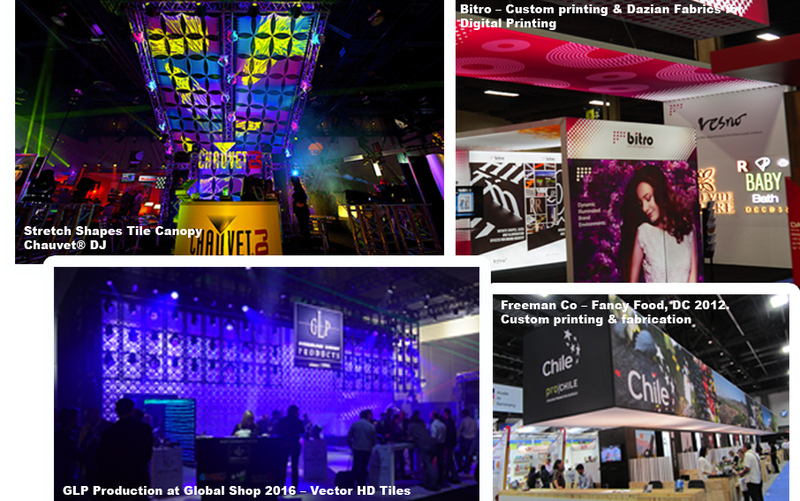 Our extensive custom fabrication capabilities provide Exhibit Builders with an innovative resource that specializes in creating unique branding opportunities for their clients using fabric substrates.